I visited the Emirates this week. Something in my DNA drew me to the stadium. I just had to get off the train at Drayton Park and walk the familiar streets to the ground just to be there. The massive concourse around the stadium was eerily empty and silent, but today it will be alive again, heaving with the throng of 60,000 excited football supporters. The Emirates Cup is an opportunity for many Gooners, young and old who don’t have season tickets, to get inside the ground and experience the atmosphere. Countless numbers of photographs will be taken with the pitch as a backdrop, or framed against the huge Arsenal crests that adorn the outside of the stadium. I am fortunate, I get to go to every game, but I really enjoy the fact that there will be so many enthralled children in the crowd over these two days – it is a brilliant means of recruiting the next generation of gooners. I know the cynics will say its just a money making exercise, but for those children and adults dressed in their kit with their name or the name of their hero on their back, it is a really special occassion. For us ‘regulars’, there is the comforting feeling of knowing you’re home again when you take to your seat for the first time after so many weeks away. Though we won’t be surrounded by the familiar faces to which you’ve become accustomed in Premiership games, all these people have come to cheer on the team that wear the Red and White of Arsenal. Additionally, although the tournament means nothing, it will be reassuring to witness our boys wearing the great new home kit which echoes the style of our glorious past. Unfortunately, because of the World Cup, we’ll still be missing several players so I’m not even going to guess how the team will line up. 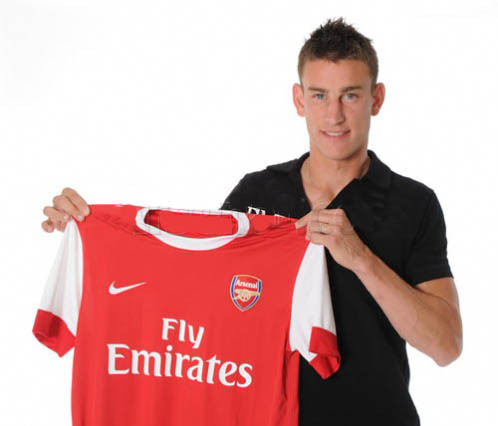 Will any questions be answered about who is going to have the no1 shirt or who will partner Thomas Vermaelen at the back? – I doubt it. These issues have been foremost in our minds all summer and it looks like we’ve still got some way to go before we discover the answers. I’m seething at the thought that we may have let Sol Campbell go for the sake of a few thousand pounds a week and that Silvestre could yet end up wearing an Arsenal shirt for another season if we fail to find the 4th centre back Arsène has said we need. Last year Rasp and I laughed at how Eboué grabbed the trophy and paraded it around the pitch as if he’d won the World Cup. The rest of the team looked on slightly sheepishly, realising that this trophy would mean zilch if it wasn’t followed by a couple of others in the season to come. So here we all stand again looking forward to the season ahead. 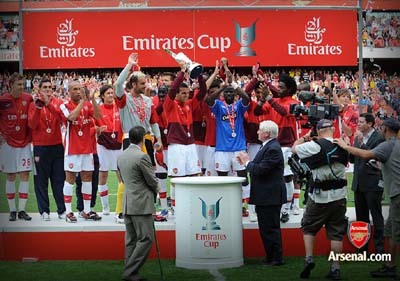 The Emirates Cup in our trophy cabinet is not enough Arsène but you don’t need me to tell you that. If you’re going to the Arsenal this weekend, enjoy it, it’ll be the last stress free game until this time next year. Arsenal in crisis! …. what crisis? I am really getting fed up with all the dross coming out of the ‘red tops’. Yesterday, they reported that we are doomed for another season as RVP and Fabregas wouldn’t be fit enough to play in our opening game at Liverpool. They are certain our spending is finished for another summer and our hopes for next season are all but over. They highlight the fact that Bendtner will also miss the opening games, (which we all knew several weeks ago) and Denilson and Diaby are also a doubt. Some Arsenal sites panic at all this make-believe stuff. The internet has been littered with headline posts calculated to provoke reaction. Our ‘fantasy predicament’ pales into insignificance compared to the mess Liverpool are in, with an injured Torres, and Carragher, Kuyt and Gerrard burnt out after the World Cup. The new manager, Roy Hodgson has an enormous task ahead in trying to produce a side that meets the expectation of the Liverpool fans. What Wenger actually said was that he would address the situation on the 5th August. He didn’t say that RVP or Fabregas wouldn’t play. Denilson and Diaby both have slight groin strains but would most probably be available although Bendtner aggravated his groin problem and was always going to miss the start of the season. Luckily we have Chamakh now who it is likely will compete with Bendtner for a starting place in the side any way. Year after year the media ‘will us to fail’ and try every conceivable method to brainwash a gullible audience, some of whom fall for it every time. Wenger isn’t stupid, I’m sure he wants to buy where we need cover. He knew months ago that Gallas, Silvestre, Senderos and Campbell were out of contract and would probably leave, and at the same time he would have assessed our present cover. The pre-season games in Austria will have given him a better understanding of the strengths and weaknesses in the squad . Look how little activity there is from the top clubs so far this summer. There is a worldwide recession. Most PL clubs are in so much debt that,the penny has finally dropped. The days of buying players at over inflated prices must stop (unless you’re man city) but also, the availability of top players is limited. Have you seen many who played in the world cup change clubs? City will continue to splash the cash, but making wholesale changes doesn’t always equate to a winning formula . I feel very confident that we have a good balance now in the squad and will still buy at the least another centre back. What is it about the Daily Mail? No matter how much I try to ignore Fleet Street’s greatest embarrassment, I can’t help finding new things about this fear-mongering, xenophobic, Thatcherite rag to annoy me, usually via a Newsnow link. This time it wasn’t some load of nonsense about how we’ll all be mugged by Kosovan asylum seekers if we even dared to step outside our front doors into the warzone that is 21st century British suburbia; it’s just another piece of journalistic sloppiness about football. MJC posted a very good piece a little while ago about how the new 25-player squad rules will work – to recap, he explained that essentially (a) any player who is born on or after 1 January 1989 doesn’t count towards the 25-player limit at all for the coming season and (b) of the 25 “older” players, eight places are reserved for players who spent at least three seasons in England and Wales between the ages of 16 and 21 – these are “homegrown players”. Importantly, but apparently beyond the wit of the Daily Mail, homegrown players can have any passport, it’s just where they trained in their early years that counts. So, Owen Hargreaves, as a Bayern Munich trained player, isn’t homegrown despite being English (sort of), but Nicolas Anelka is homegrown despite not being English and having played in France, Spain and Turkey as well as England. Clubs can have more than eight homegrown players, it’s just a quota to protect against importing too many established players from other leagues. * Arsenal: Squad of 33, of which 13 are under 21. We therefore have five spaces left for non-homegrown players aged over 21. * Chelsea: Squad of 27, of which five are under 21. They therefore have three spaces left before they reach the 25-player cap, two of which are for homegrown players. * United: Squad of 33, of which eight are under 21. United therefore have no spaces in their squad, so can’t make new signings without omitting existing squad members. * Spurs: Squad of 29, of which four are under 21. They also have no space left in their squad for senior players. * City: Squad of 31, of which six are under 21. But not only do City have no space left in the squad, even before making any further signings, they will already have to omit seven existing senior players. Of course, none of this matters if our regular first choice players aren’t up to it, but we are clearly in great shape to get the best out of these rules. Only Chelsea come close to being in as good a position. But what did the Daily Mail say? They of course said that United are doing well because they have lots of English players, but thought Arsenal and Chelsea would have to omit players. In fact, it’s the other way around, United are the worst positoned of last season’s top three. It’s a shame that there are so many people paid to write about our game who don’t know enough about it, or are too lazy to check. SC Neusiedl 1919. 0 Arsenal 4. With yet another good workout satisfactorily completed the thoughts will turn to The Emirates Cup, where we might really begin to judge our squad at a much higher level, but I will leave that for another time. The first thing that struck me last night was the stadium, the infamous Sportzentrum Neusiedl. Even allowing for the fact that Neusiedll were being compared to a Conference side, it appeared that someone had quickly assembled a pitch in a far flung park somewhere in eastern Austria. Nevertheless there was a capacity crowd of 2500, amongst which I must have spotted at least 400 kids happily enjoying their ice creams. Back to more serious matters. We had learnt earlier in the day that Sol had finally decided to leave us for the heady heights of Newcastle and I’m sure all of us wish him well and even at the ripe old age of 36, I feel it would have been beneficial to have him still in our squad. This was further compounded with the sad sight of Djourou leaving the field after barely 20 minutes, and this may turn out to be a blessing in disguise, as the need for a centre back is now a must. I won’t give you a match report as it wasn’t really a game, but in the first half Nasri shone way above anyone else and looked sharper than ever. Wilshere also had a fine first half and was reintroduced midway through the second half. I hope the boss was thinking that the lad is now ready to be an active member of our first team squad. Frimpong, after a slow start impressed yet again, and it was as nice to see Carlos score with his customary chip, as it was to see Theo score and Chamakh cooly slotting in his first goal for the club from the penalty spot. 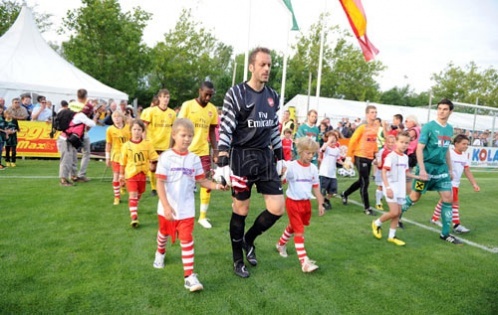 Many were surprised to see Almunia start let alone as captain, but I wouldn’t read too much into that. For those who were not aware, Rosicky was withdrawn 10 minutes before the start. Generally we still look vunerable in defence and again our crossing needs to improve dramatically. This is a real issue for me, but on the other hand we will see a radically different line up for the first game at Anfield. Arshavin is a canny player and one gets the impression, not for the first time, that he is saving himself for the games that really matter. All in all maybe a few questions were answered for the boss and finally it was nice to see Gibbs back in the team, though he may well need a good few weeks to regain his sharpness. JET for a big lad had a very compact game, but I doubt he is quite ready for the first team, and a word for Mannone who has hardly been mentioned lately, a good penalty save and basically nothing much else to do. Roll on Saturday and A.C.Milan. Arsenal get it wrong again. The closing of the transfer window at midnight on the 31st of August is still over a month away. Yet the football blogs are awash with disconsolate fans, convinced in their own minds, that the fact that their club has not yet purchased the top player they believe is indispensable, is proof positive that the club or manager lack ambition. Arsenal are a case in point, having just paid £8.5 million for a centre half that had been scouted and watched continuously for months by the same people who had evaluated and recommended Thomas Vermaelen for AW. We immediately find our new man is derided as not good enough, supposedly lacking class, not the world-beater the club needed. These opinions based mainly on the amount of money paid for the player. The argument being, if he was any good he would have cost more and of course it also proves no one else is coming in because AW wouldn’t spend that much on a back up. Regardless of the fact that at this level football is a squad game. Mind you TV himself, quoted by many judges as the best PL buy of last year, is, according to these blogging super coaches part of the problem. He isn’t big enough even if he has a big jump, he is easily knocked off the ball by bullying centre forwards and needs a giant next to him for protection at set pieces. I would love one or two of these guys to tell him that to his face. He doesn’t look a pushover to me. In thinking about this I am reminded of Brian Clough, “Cloughie” in his heyday loved punters, fans and pundits to tell him what he needed. Rumour has it, that on one memorable day he was informed by a reporter that the European club they were going to play had a centre forward who was the most deadly header of the ball in the business, “Don’t you worry young man says Cloughie, we have a secret weapon, a young man from a pacific island, he is 7’3” cant kick for toffees but makes his living heading and cracking coconuts as they fall from the tree, how’s your man going to deal with that” says Brian and walks of laughing. More than a month remains of this transfer window. More business is usually done in the final fortnight than in all the preceding weeks. Personally, I am going to sit back, watch the preseason games, enjoy the silliness on the blogs, TV and radio and await the first of September with anticipation, knowing that the boss is more likely, than probably any other premiership manager to surprise us all with quality players – in his own good time! Another Saturday and another Arsenal friendly for your humble scribe (having made the trip to Underhill last weekend with the ArsenalArsenal crew), but thanks to the vagaries of the M25 I missed the first 20 minute or so of the pre season friendly against Blue Square team Welling United, known as ”The Wings”. The aged turnstile attendant told me “Its one-one mate” as I finally arrived at the Park View Ground in Welling, one of my old stamping grounds(my school was a misplaced Bendtner shot away from the Danson Park end of the ground); technically in Kent, but in reality an outer London borough that borders north west Kent. It is also a short five minute drive away from the original home of the Gunners, Plumstead Common, so you could say we were back to our roots in this game. The feeling in the ground that the £11 admission was a bit steep and the quality of the play, certainly from us, tended to support that view. To their credit Arse.com did say that is was very unlikely any first teamers would feature so I suspect it was Welling United who were responsible for the pricing. 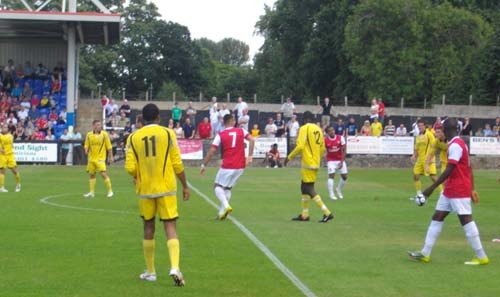 Having missed the first two goals, a screamer from Gavin Hoyte and a supposedly generous penalty for the Wings after a chap called Pires was upended in our area; the remainder of the first half saw the Arsenal X1 keep possession fairly well in the centre of the park but as usual over elaborate as the penalty area was approached. No one especially impressed and in particular Randall seemed quite content to stroll around midfield waiting for opportunities to play the odd flick or lofted pass. He barely seemed to be out of breath at any point in the first half. With the first half being fairly lack lustre you would have thought the second half would see Arsenal come out with renewed vigour after a Liam Brady rocket had been placed up their complacency. What I saw was a Welling side fighting for possession in the midfield and at any set piece a hesitancy in the defenders which screamed out that we would concede with a corner or a cross -which sure enough we did. To my eyes it seemed the centre backs were waiting for each other to clear the ball and on one of those occasions a Welling player pounced for a tap in. One of the centre backs, Ignasi Miquel, is another one of those Catalans we stole from Bankruptalona against his will. Should he come good then it would behove us to return him “home” as long as the DNA test proves we have a moral obligation to do so. Of the last two goals one was as a result of a forward having a try from distance, surely that’s not allowed? The other goal was a goal keeping error as the goalie fumbled and an opposition player pounced and scored from the rebound. Now does that not remind you of the first team somewhat? I’ve heard it said that one’s greatest strength can be ones greatest weakness also. Arsenal’s possession game is played from the top down, from the first team to the reserves and the under 18’s, which – when it works is all well and good – so in that respect all our teams have a consistent approach which I don’t have any complaint with. However our lack of decisive defensive play leads to a more willing and industrious opponent being able to exploit counter attacks when the possession game falls apart. This was very much the case in the second half. It didn’t help that I had a Welling supporter behind me bellowing “Break his legs” whenever one of our midfielders brought the ball forward, the fact that none of our players reacted to that taunt from only 10 feet away shows we expect to hear that sort of goading. He then crowed “Who are you? !” when the fourth goal went in. Ah, the joys of the terracing. I was hoping to see this game in order to watch a glimpse of our future; however the problems of the present were flagged up again. Still, the upside was the new home kit still looked smashing and I’m looking forward to member’s day when I can see the next stage of Arsenalisation at Ashburton Grove. After many months of speculation which has stirred up so much animosity amongst the Arsenal faithful, it finally looks as though this summer’s biggest transfer saga will not be settled until 2010 at the earliest. This was taken to be a reference to the ten of thousands of pounds that Stevenage are having to invest in new CCTV cameras at their ground this summer in order to meet minimum Football League arrest quotas. Meanwhile, in a stunt that was obviously intended to drive a wedge between the player and the Arsenal fans, Wilshere was grabbed from behind by a number of Stevenage Borough footballers during a live charity radio broadcast and was forced to dress up like a chav – the official Stevenage uniform. This is just a bit of fun for a Sunday morning, we’re still around to debate serious Arsenal issues like our lack of defensive cover and whether Arsene Wenger is going to spend any more money in this transfer window.